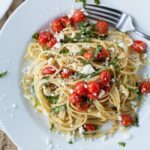 An easy weeknight pasta dish that is bursting with fresh flavors! Sun-dried tomatoes add a wonderful flavor to a silky cream sauce while baby spinach adds a wonderful color and freshness to the dish. Hello! I’m ashamed at how long it has been since I’ve posted ?. I had every intention of sitting down last Sunday and typing up this post for last Monday. However, the stomach bug decided to hit me like a truck and keep me down for almost a week. It was downright awful! I couldn’t eat or get out of bed for about 4 days. Luckily over the weekend I was able to eat actual meals and am feeling SO much better. The next few weeks are going to be interesting as it seems I have a million things to accomplish. Wedding = 25 days away ??. 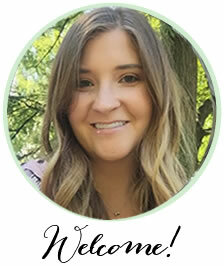 Enough about me – anything new with you? 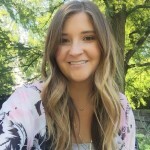 Have I missed anything in the blogging world? Since moving I’ve been all about quick and easy meals. Most of my time over the past few weeks has been spent unpacking, setting up rooms, then chaining them all around. I’m learning that it’s really hard to decide on where to put everything right off the bat. My type A personality needs order and everything has to make sense, so when it doesn’t I can’t rest! I’m getting there slowly, though. I also spend a lot more time cleaning than I ever did. Moving from apartment to house means a lot more to keep clean! Anyway back to the point I was trying to make – quick and easy meals are a must these days. 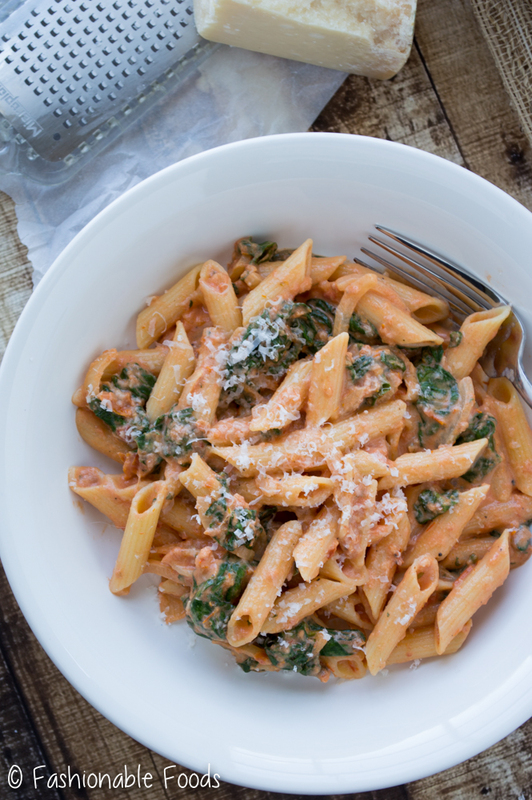 This penne with sun dried tomato cream sauce and spinach totally fits the bill. It’s comforting, but not overly heavy and of course it’s full of flavor! 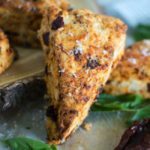 Sun dried tomatoes are such a great way to add flavor to so many different dishes. If you’ve never tried them (is that even possible?!) they have a really concentrated sweet tomato flavor. You’ll commonly find them jarred with herbs and olive oil, however for this recipe you want the dried ones that are not packed in oil. You can typically find little bags of sun dried tomatoes near the jarred ones or by the other specialty Italian products in your grocery store. However, if you can’t find them, you can use the jarred variety, but be sure to drain the oil and pat them very dry. You’ll want to steep the sun dried tomatoes in chicken stock for a few minutes. This step not only softens the tomatoes, but it really helps infuse the flavor into the stock. Whirl it up in a blender and add it to sautéed onions and garlic, simmer for 5 minutes, and then stir in a smidgen of heavy cream. Ok, so it’s more than a smidgen, but it’s not that much. 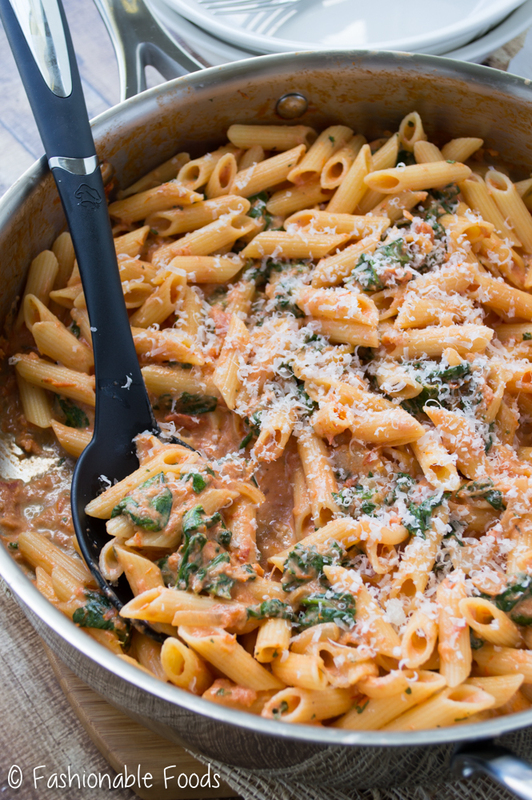 Stir in your pasta and cheese… because we wouldn’t have a pasta dish without cheese, right? And, don’t forget the fresh baby spinach! Basically in the time it takes for the water to boil and the pasta to cook, you’ll have dinner on the table. The leftovers are tasty, too. ? If you eat low carb, feel free to try this sauce with spaghetti squash, spiralized zucchini, or any other veggie noodle. I will definitely be having this with zoodles this summer! Cook the pasta in a large pot of salted boiling water according to the package instructions. Drain the pasta, reserving 1 cup of the water, and then rinse the pasta with hot water*. Meanwhile, add the chicken stock to a small pot and bring to a simmer. Add in the sun-dried tomatoes, turn the heat off, and allow the tomatoes to sit for 5-8 minutes or until they are rehydrated. Pour the broth and sun-dried tomatoes into a blender and process until mostly smooth. Set aside. Heat a 12-inch skillet over medium-high heat and add in the oil. Once the pan is hot, add in the onion and sauté for 2-3 minutes or until it begins to soften. Add in the garlic and red pepper flakes (if using) and stir until fragrant. Season the mixture with salt and pepper. Pour the sun-dried tomato mixture into the pan and bring to a low simmer for 5 minutes, then stir in the heavy cream. 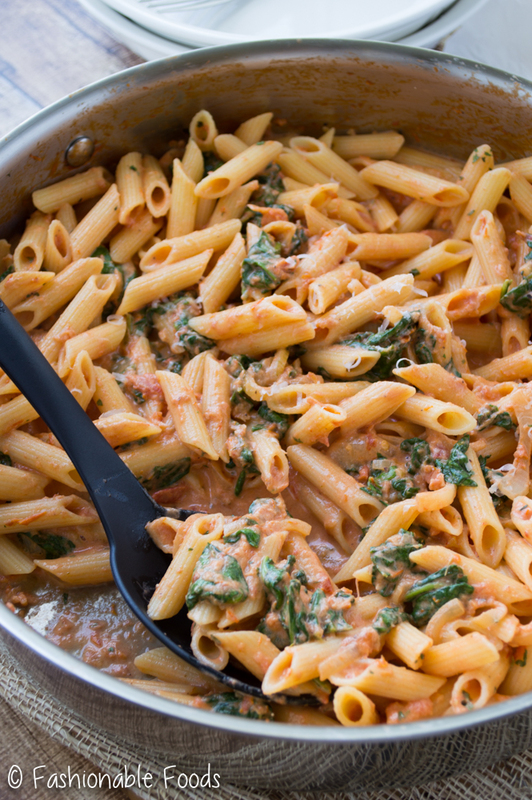 With the heat on low, add in the cooked pasta, cheese, and spinach. Stir the pasta until the spinach wilts, adding a little pasta water if the sauce seems too thick. Serve topped with additional parmesan cheese. *My favorite dried gluten-free pasta is Barilla, but feel free to use your favorite. If you aren't gluten-free simply use regular wheat pasta. You can also try this with spaghetti squash or your favorite spiralized veggies! *I always rinse gluten-free pasta with hot water to get rid of the extra starch that can make the sauce gummy. If you are using regular wheat pasta, you can skip the rinse. If you can't find sun-dried tomatoes that aren't packed in oil, you can use the jarred variety. Just be sure to drain the oil off and pat them very dry. Ugh stomach bugs are n o fun! So glad you’re feeling better! And easy meals are definitely needed with moving. 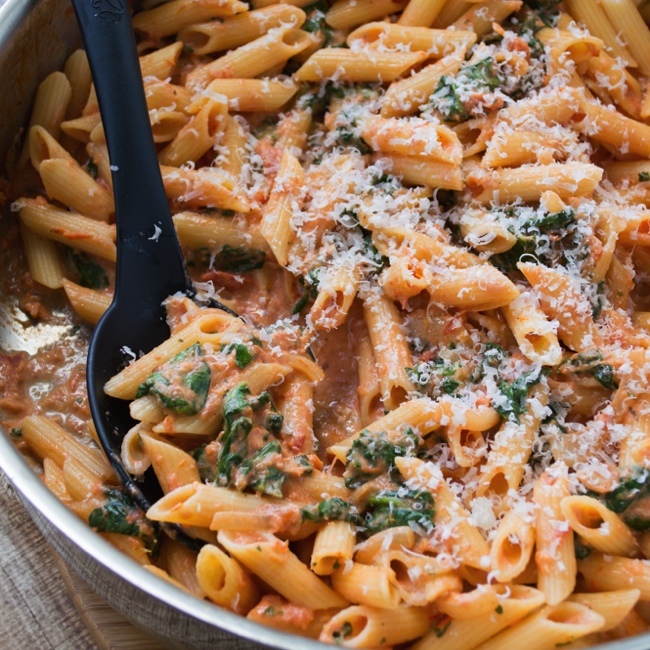 This penne looks SO good! I’ve never made my own tomato cream sauce before, so I will have to try this out. Love the looks of it! Thank you Gayle! 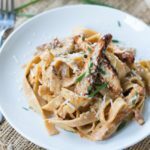 You definitely need homemade tomato cream sauce in your life – it’s one of my favorite pasta sauces! Oh no! I’m sorry you were so sick and happy that you’re feeling better! 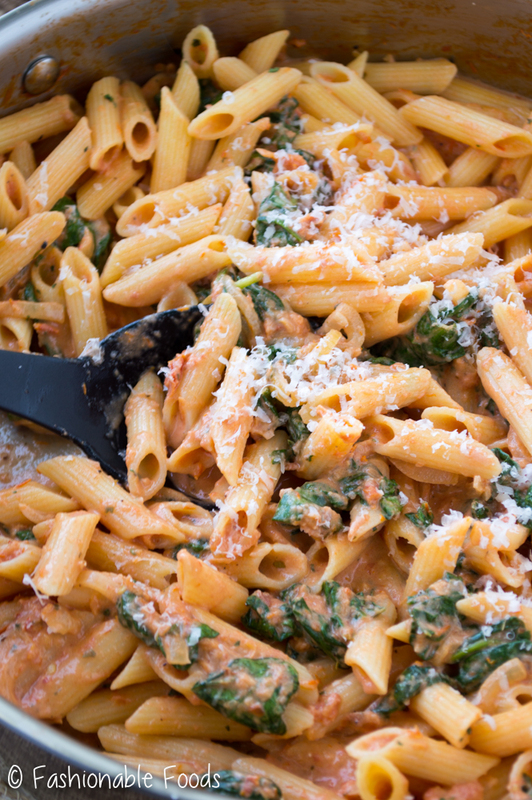 I love pasta and quick and easy, so this penne and sun dried tomato sauce sounds perfect! I can’t believe your wedding is only 25 days away! So exciting! Thank you so much Rachelle! I can’t believe it either! Made this tonight and it was great!! Thanks so much! Found this recipe on Pinterest and all I can say is thank you! This recipenis delicious and has been my saving grace many nights!